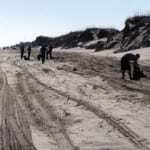 You are here: Home / News / Corolla Wild Horses News / Awesome Volunteers! Volunteers ready to go to work. They covered a lot of ground that afternoon! Imagine carrying all this down the beach! Thank you so much volunteers! During their Thanksgiving break, this group decided to give thanks by giving back! While planning their recent trip to Corolla, Jena and Anthony Mazzio, Jon, Erica, Cindy and Rocco Parise, and Gina and Valerie Philippi contacted the Corolla Wild Horse Fund for a volunteer project that would benefit the wild horses. As frequent visitors to the area, this group understands involvement in protecting the horses’ habitat is necessary for their continued survival. They showed up in force on Friday, November 23 to tackle the day’s work. 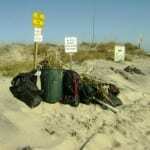 Supplied with trash bags and gloves, they combed several miles of the four wheel drive beach for hours collecting an impressive pile of trash that would otherwise become a hazard to the wild horses, visitors and vehicles. Our dedicated Corolla Ocean Rescue came through with a plan to pick up all the trash that was collected that same afternoon. A huge thank you goes out to this awesome group of volunteers! Way to go! https://www.corollawildhorses.com/wp-content/uploads/2015/03/CWHF-headerlogo.png 0 0 Corolla Wild Horse Fund https://www.corollawildhorses.com/wp-content/uploads/2015/03/CWHF-headerlogo.png Corolla Wild Horse Fund2012-11-29 15:23:232012-11-29 15:23:23Awesome Volunteers!